The geysers in Yellowstone National Park are as breathtakingly beautiful as they are mercurial. Old Faithful is famous in part because of its predictability, since most of these natural fonts are much more inscrutable. Something odd is going on in Yellowstone National Park. Geysers that would once erupt every half century are now spouting steam every week. And, late last year, one slumbering geyser — dubbed Ear Spring — vomited up 80 years worth of trash. The spring’s last big blow was in 1957. So, when it blew to a height of some 9m in September, National Parks officers spent days collecting old coins, beer cans, and even a 1930s baby dummy from its surrounds. “An approximately 8-foot diameter area of surrounding ground is ‘breathing’ — rising and falling by about six inches every 10 minutes,” USGS researchers said. While the eruption offered up an interesting time capsule, it’s also represents of what researchers are calling an unusual upturn in geyser activity. The Steamboat geyser used to erupt erratically, sometimes after a duration as short as four days or as long as 50 years. Lately, it’s been sending spouts of steaming water 90m high into the air once every week. The Yellowstone Volcano Observatory says it erupted 32 times last year. However, USGS and park officials have stressed in recent months that there have been no signs of volcanic activity. 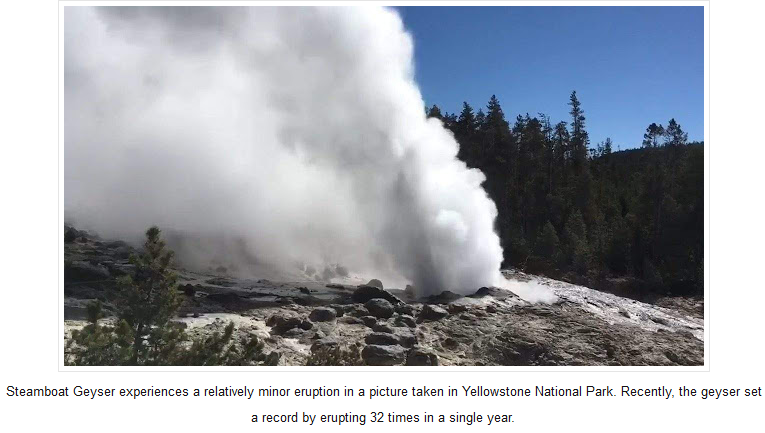 “Changes in Yellowstone’s hydrothermal features are common occurrences and do not reflect changes in activity of the Yellowstone volcano,” they said in a statement. This is because the hydrothermal system — where water pools among the cracks in the rocks of the earth’s surface — is limited to mainly just the top 30m or so. The magma that triggers volcanic activity resides several kilometres deeper. “There has been no significant increase in seismicity nor broadscale variations in ground movement,” the USGS says. And the geysers’ behaviour remains erratic. With all this in mind, do we know what’s going on at Yellowstone? There’s been no change in the underlying heat source, and no major geological changes, Poland says. However, the last few years have been exceptionally snowy, so a change in the supply of subsurface water may be a major factor. As it happens, the second-longest earthquake swarm in the park’s recorded history took place in 2017. Research tentatively suggests that the same heavy precipitation may have provided the faults involved with plenty of lubrication, allowing them to jut forward with reckless abandon. What absolutely isn’t worth speculating about is the state of Yellowstone’s infamous volcanic system. Any uptick in any sort of activity at Yellowstone seems to spark fears about a catastrophic eruption of the park’s huge caldera, even though such worries are unfounded. There has been no change to the underlying magma reservoir over the past few years, Poland emphasizes. Plus, the mischief of any of the park’s geysers—which operate at the very top of the crust—has no bearing whatsoever on that mostly solid magma cache many miles below the surface.